Click here to see Collies who have been adopted thru Collie Rescue! Announcements go here. Be sure to change style display from none to block. It's a wrap. The votes have been cast, the polls have closed. 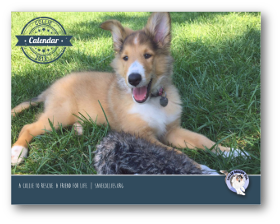 Now it's time to pre-order your 2019 Collie Rescue, Inc Collie Calendar before November 20, 2018! Simply click the Buy Now button below to order your calendars today! Orders are now shipping. Collie Rescue, Inc continues to participate in the Combined Federal Campaign. You can find us by using our CFC number: 39733. Pledges may be made during the campaign season, September 1 to December 15. Collie Rescue, Inc is now partipating in the Commonwealth of Virginia Campaign. You can find us by using our CVC number: 009792. Collie Rescue Needs Your Help! As you know, most Collies who find their way to Collie Rescue, Inc (CRI) have been through a lot. With proper veterinary care, a consistent and healthy diet, and lots of love, these remarkable creatures are capable of returning to health and provide so much to those who adopt them. Getting the Collies cleaned up, however, takes resources. The "Sponsor a Collie" section will spotlight a Collie who is need of non-routine veterinary care. In 2010, the average cost per Collie was over $450 and almost 60% were not spayed or neutered. If you look at our adoption fee, you can see that CRI could not help the Collies that we do, without your generosity in giving donations. Please click here , print out this flyer, and post it in stores/public areas near you. CRI needs to get the word out that we have LOTS of collies who need homes. With your help, we can do it! Sign up for Collie Rescue News! Our love of collies has brought us together to focus on the breed we love the most! The rescue is comprised of many volunteers with diverse backgrounds such as collie enthusiasts, veterinarians, behaviorists, and collie club members. Our volunteers have been rescuing collies in Virginia and Maryland, as well as networking with collie rescues in nearby states since the beginning of 2005. Since its inception, Collie Rescue, Inc. has saved well over 275 collies from shelters and owners who no longer wanted their pets. Collie Rescue, Inc. is a 501(c)(3) tax exempt organization. Our mission is to place stray, abandoned and surrendered collies into loving and permanent homes, educate the public about the collie breed, and promote responsible pet care. Our goal is to provide a safe and healthy haven for all dogs placed in our care until loving, adoptive homes can be found. Collies who find their way into our rescue are first examined by a veterinarian, vaccinated, heartworm tested, microchipped, and spay/neutered. All dogs are given the veterinary care needed to get to a healthy state. They are placed in foster homes where they are evaluated in order to find the best home for them. We provide heartworm medication and parasite prevention until they can be placed. Our foster homes provide food, lots of love and training! Potential adopters complete a short adoption questionnaire online. CRI adoption coordinators evaluate the application and follow up within 10 days if they feel that CRI currently has a dog who will be a good match. If there is a good match, you will receive a call and a more extensive interview will take place. At that time, you too can interview us about our adoptable dogs. After the interview, our coordinators check veterinary references, verify home ownership, conduct home visits and arrange a meet between you and the adoptable dog. If you already have a dog, you must bring that dog to meet ours. We feel that getting to know our adopters (and their pets) results in a better placement for both the pet and the families! CRI provides as much information as we can on each pet’s history, disposition and health. After a placement, we follow up with each new adopter to offer assistance during the adjustment period. We want each of our animals to find the right home for them, not just any home. Likewise, we want our adopters to find the pet who best matches their lifestyle and interests. If for any reason the match is not perfect, as we had hoped, the dog must be returned to our organization. A creative person who can create flyers of our rescue dogs and email them out to our list and post them in public places. Each of the following online stores or services donates some percentage of funds back to Collie Rescue, Inc. Be sure to read the simple instructions provided by each supporting organization to ensure that your usage counts to help Collies in need! Simply use GoodSearch (powered by Yahoo) to search the Internet. Each time you search the Internet $0.01 is donated to Collie Rescue!. Or shop online at iGive.com/CollieRescue. Up to 26% of each purchase you make goes to support Collie Rescue, Inc. Your shopping at hundreds of very popular online stores helps benefit our cause with each purchase! Collie Rescue Inc. could not exist without contributions from our supporters. 100% of your donations will go towards the rescue and care of the collies that we save. Please note that if you are donating in honor of, or in memorial of someone, please click on "Add special instructions to seller" and specify the person or pet for whom the donation is being made. And now Collie Rescue Inc. has made donating even easier! Simply click on the following "Make a Donation" button to show your support via a secure PayPal transaction. Or, you can mail a check made payable to Collie Rescue, Inc. to POB 221982, Chantilly, VA 20153. If there is a special animal or person you would like to honor, consider a gift in their name to Collie Rescue, Inc’s Memorial Gift Program. Your donation will help us to provide health care for collies in need. Collie Rescue, Inc. will promptly send a personalized card to the person or family indicated, notifying them of your thoughtful donation. You will receive a tax deductible receipt. Memorial request forms are available for download in two popular formats, PDF (181 KB download), and Microsoft Word (181 KB download). Need Help Keeping Your Pet?